The Civil War profoundly shaped the United States as we know it today. Nevertheless, the war remains one of the most misunderstood events in American history. Here are ten basic facts you need to know about America's defining struggle. Fact #1: The Civil War was fought between the Northern and the Southern states from 1861-1865. The Civil War, also known as “The War Between the States, ” was fought between the United States of America and the Confederate States of America, a collection of eleven southern states that left the Union in 1860 and 1861 and formed their own country in order to protect the institution of slavery. Jefferson Davis, a former U.S. Senator and Secretary of War, was appointed President of the Confederate States of America. The United States thought that the southern states were wrong to leave the Union and initiated a war that raged across the country for four years. In 1865, the United States defeated the Confederate States and abolished slavery nation-wide. Fact #2: Abraham Lincoln was the President of the United States during the Civil War. Abraham Lincoln grew up in a log cabin in Kentucky. He worked as a shopkeeper and a lawyer before entering politics in the 1840s. Alarmed by his anti-slavery stance, the southern states seceded soon after he was elected president in 1860. Lincoln declared that he would do everything necessary to keep the United States united as one country. He refused to recognize the southern states as an independent nation and the Civil War erupted in the spring of 1861. On January 1, 1863, Lincoln issued the Emancipation Proclamation, which freed the slaves in the southern states and laid the groundwork for slaves to eventually be freed across the country. He narrowly won re-election in 1864 against opponents who wanted to sign a peace treaty with the southern states. On April 14, 1865, Lincoln was assassinated by John Wilkes Booth, a southern sympathizer. Fact #3: Before the United States was formed, many different civilizations existed on the American continent. Native Americans have lived in North America for more than 12, 000 years. Around 400 years ago, people from the Netherlands, England, Spain, and France arrived in North America and began to establish small, independent colonies. These different civilizations traded, mixed, and fought with each other. In 1789, they united and formed a common government based on an agreement known as the Constitution. Many considered the Constitution to be a non-binding agreement: they believed that the different civilizations, now called “states, ” could leave the common government at any time they chose. Fact #4: The issues of slavery and central power divided the United States. Slavery was the law of the land, north and south, until the early 19th century. It was concentrated in the southern states, where slaves were used as farm laborers and formed the backbone of the southern economy. In the northern states, where industry drove the economy, many people believed that slavery was immoral and wrong. Southerners felt threatened by these northern “abolitionists” and claimed that the common government had no power to end slavery against the wishes of the states. Eventually, southerners became convinced that the common government would attempt to abolish slavery nation-wide. Eleven states left the United States in the following order and formed the Confederate States of America: South Carolina, Mississippi, Florida, Alabama, Georgia, Louisiana, Texas, Virginia, Arkansas, North Carolina, and Tennessee. Fact #5: The Civil War began when Southern troops bombarded Fort Sumter, South Carolina. When the southern states seceded from the Union, there were still a few forts on southern soil that were manned by United States soldiers. Rather than surrender the forts, President Lincoln attempted to resupply the soldiers by sea. The Confederacy learned of Lincoln’s plans and demanded that the forts surrender under threat of force. When the U.S. soldiers refused, South Carolinians launched a bombardment of Fort Sumter in the Charleston harbor. After a 34-hour battle, the soldiers inside the fort surrendered to the Confederates. Legions of men from north and south joined with their leaders to protect their interests. The primary interest of the north was to maintain the United States as a single, undivided country. The primary reason for the south seceding from the Union was to protect the right to own slaves. Fact #6: The North had more men and war materials than the South. At the beginning of the Civil War, 22 million people lived in the North and 9 million people (4 million of whom were slaves) lived in the South. The North also had more money, more factories, more horses, more railroads, and more food. These advantages made the United States much more powerful than the Confederate States. However, the Confederates were fighting defensively and their soldiers and generals frequently proved to be more skilled than their northern counterparts, allowing them to mount a stubborn resistance to the United States. Fact #7: The bloodiest battle of the Civil War was the Battle of Gettysburg, Pennsylvania. The Civil War devastated the Confederate states. The presence of vast armies throughout the countryside meant that livestock, crops, and other staples were consumed very quickly. In an effort to gather fresh supplies and intimidate the United States, Confederate General Robert E. Lee launched a daring invasion of the North in the summer of 1863. He was defeated by Union General George G. Meade in a three-day battle near Gettysburg, Pennsylvania that left nearly 52, 000 men killed, wounded, or missing in action. Many historians mark the Battle of Gettysburg as the “turning point” in the Civil War when the South began to lose. After the battle, President Lincoln delivered the Gettysburg Address, which expressed firm commitment to preserving the Union and became one of the most famous speeches in American history. Fact #8: The North won the Civil War. After four years of conflict, the last major Confederate armies surrendered to the United States in April of 1865. The war bankrupted the South, left its roads, farms, and factories in ruins, and all but wiped out an entire generation of men. More than 620, 000 men died in the Civil War, more than any other war in American history. 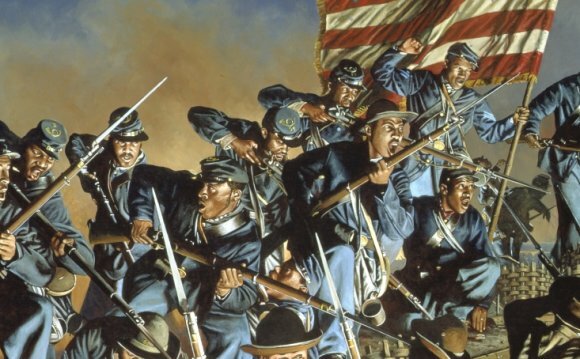 The southern states were occupied by Union soldiers, rebuilt, and gradually re-admitted to the United States over the course of twenty difficult years known as the Reconstruction Era. Fact #9: After the war was over, the Constitution was amended to free the slaves, to assure “equal protection under the law” for American citizens, and to grant black men the right to vote.